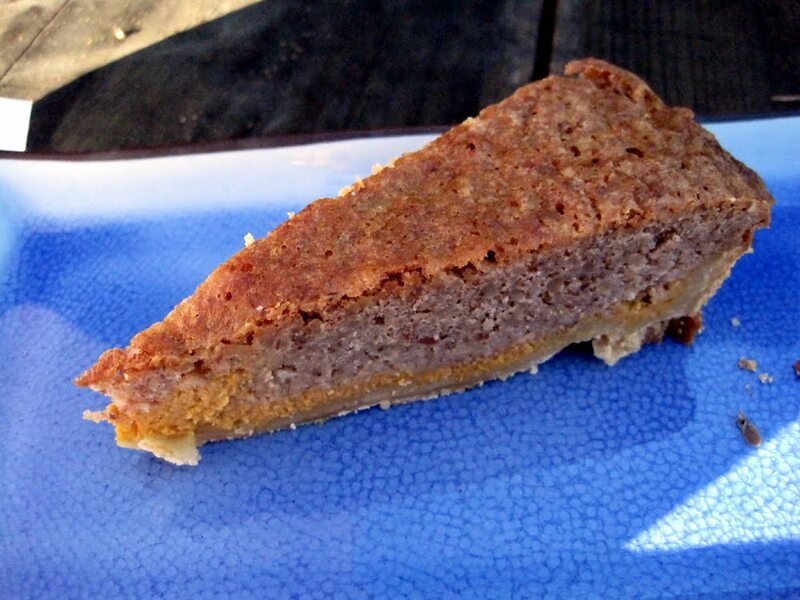 The theme for this month's YWPWT is Pumpkin Pie with a Twist. I decided to go with a combination pumpkin-pecan tart, since these are two of my favorite Thanksgiving pies. This is an autumn version of the Bakewell tart we made for Daring Bakers in June, and it's every bit as delicious. The bottom crust is an easy sweet shortcrust made with brown sugar for that extra hit of fall flavor. On top of that is a perfectly smooth, perfectly spiced pumpkin pie layer. 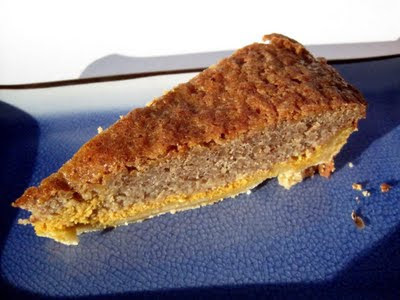 The pumpkin layer was actually a bit liquid-y for this recipe since it was a little tricky to layer the pecan frangipane on top, but it ultimately all came together in the end. 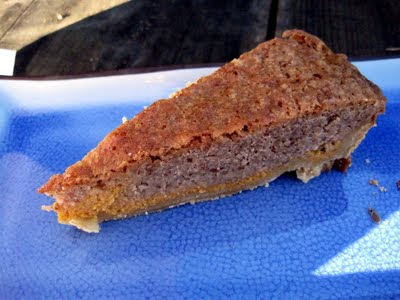 Finally, the pumpkin is topped with a sweet pecan frangipane (termed pecangipane by my housemates!). I liked this component because it has all the flavor of a pecan pie without being overly sweet or having big pieces of pecans to get stuck in your teeth. All the flavors combine really well and result in a delicious dessert that's perfect for autumn. I think the tart is best warm (either out of the oven or heated in the microwave for about 30 seconds), with a big scoop of pumpkin ice cream on the side! 1. Prepare the crust: Combine the butter, sugar, vanilla, and salt in a medium bowl. Add the flour and stir just until blended; let stand 5 minutes. Press dough onto bottom and sides of a 9- to 91/2-inch-diameter tart pan with a removable bottom. Place in the freezer for 30 minutes. 2. Preheat the oven to 350°F. Partially bake the crust until lightly browned, pressing down with back of spoon if bubbles form, about 10 minutes. Cool crust in pan on rack. 3. Prepare the pumpkin filling: Beat all the ingredients together until well combined. Rap the bowl on the counter to break any bubbles. 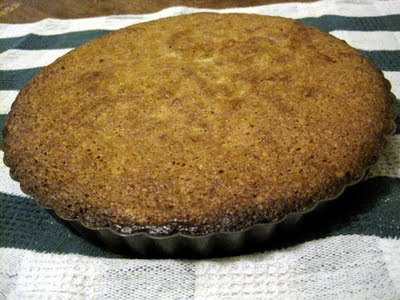 Prepare the pecan frangipane: Grind the pecans along with 1 ounce of confectioners sugar in a food processor. Set aside. In a stand mixer, cream together the butter and remaining 3.5 ounces of confectioners sugar until the mixture is fluffy and pale yellow. Add the eggs one at a time, beating well after each addition. (Mixture will look curdled.) With the mixer running, carefully spoon in the nut-sugar mixture, followed by the flour. Mix well. Assemble the tart: Preheat the oven to 400 degrees. Carefully pour the pumpkin filling over the cooled crust, filling it about halfway full. Remaining filling can be baked in custard cups if desired. Dot the pumpkin filling with the pecan frangipane, carefully spreading it to the edges. This will be a bit tricky since the pumpkin filling is on the wet side, so just do your best! Bake 40 minutes, until the frangipane is browned and puffed up. A tester should come out clean. These cannoli were absolutely amazing! 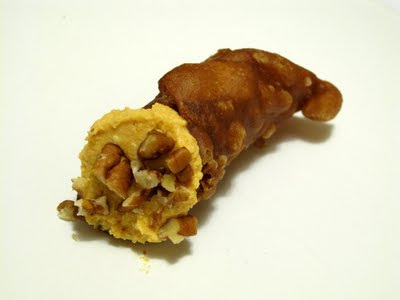 I made the given recipe for the cannoli shells, filled them with a pumpkin filling, and garnished the ends with chopped pecans. The dough was fairly easy to work with (though I definitely recommend using a pasta machine to roll it out!). Frying the dough was a bit fussy, but not too difficult. The filling, though, is really what made these cannoli shine to me. I made a pumpkin filling with homemade mascarpone and ricotta cheeses, and it was absoultely delicious! I had never made homemade cheese before, but I will definitely be doing it again. It's a big money saver since mascarpone in particular is always extremely pricey at the store. The flavor was also incredible. Especially with the fresh ricotta, it was almost like eating a different cheese than the ricotta available for purchase! Wow. I've pasted the cheese and filling recipes below, and the cannoli recipe and assembly instructions are available from Lisa. I made the cannoli for a dinner party and they were a huge hit! These really are the perfect fall dessert. A friend of mine who's a New Yorker even said these are the best cannoli he'd ever had! That definitely made me happy...so thanks to our hostess for an awesome recipe! Be sure to check out all the other cannoli this month at The Daring Kitchen. 1. Bring 1 inch of water to a boil in a wide skillet. Reduce the heat to medium-low so the water is barely simmering. Pour the cream into a medium heat-resistant bowl, then place the bowl into the skillet. Heat the cream, stirring often, to 190 F. It will take about 15 minutes of delicate heating. 2. Add the lemon juice and continue heating the mixture, stirring gently, until the cream curdles. Do not expect the same action as you see during ricotta cheese making. All that the whipping cream will do is become thicker, like a well-done crème anglaise. It will cover a back of your wooden spoon thickly. You will see just a few clear whey streaks when you stir. 3. Remove the bowl from the water and let cool for about 20 minutes. Meanwhile, line a sieve with four layers of dampened cheesecloth and set it over a bowl. Transfer the mixture into the lined sieve. Do not squeeze the cheese in the cheesecloth or press on its surface (be patient, it will firm up after refrigeration time). Once cooled completely, cover with plastic wrap and refrigerate (in the sieve) overnight or up to 24 hours. 1. Line a large strainer or sieve with cheesecloth and place the strainer over a large bowl. 2. In a large pot or saucepan, bring the milk, cream, and salt to a boil over medium heat, stirring frequently with a rubber spatula. 3. Once the milk comes to a boil, add the lemon juice all at once. Reduce the heat to low and simmer for 2 minutes, stirring gently with a rubber spatula. The mixture will curdle immediately. 4. Pour the mixture into the cheesecloth lined strainer and let drain for an hour or two. Discard the liquid whey and refrigerate the ricotta or use immediately. If you want it really dry, wrap it back up with the cheesecloth, leave it in the strainer over the bowl, weight it down with something heavy, and refrigerate overnight. 1. 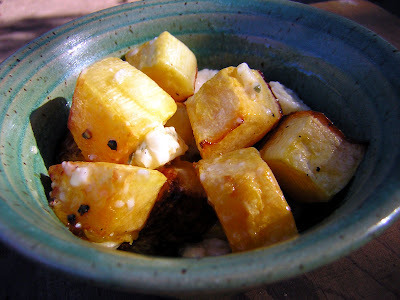 Place the ricotta cheese and canned pumpkin in a cheesecloth-lined sieve set over a bowl. 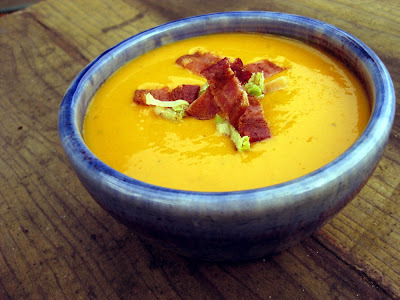 Fold the cheesecloth over the cheese and pumpkin and weight it down with a couple of cans. Place in the fridge for a few hours of overnight. 2. Place the ricotta and pumpkin in the bowl of a stand mixer fitted with the whisk attachment. Add the mascarpone and beat until the filling is smooth and creamy. Beat in the confectioners' sugar, pumpkin pie spice, and vanilla and blend until smooth. Chill until the filling firms up a bit and then fill cannoli. Also...check out this great giveaway on Grosgrain: Charm Design Bags and Totes $50 gift card GUEST GIVEAWAY!!!! 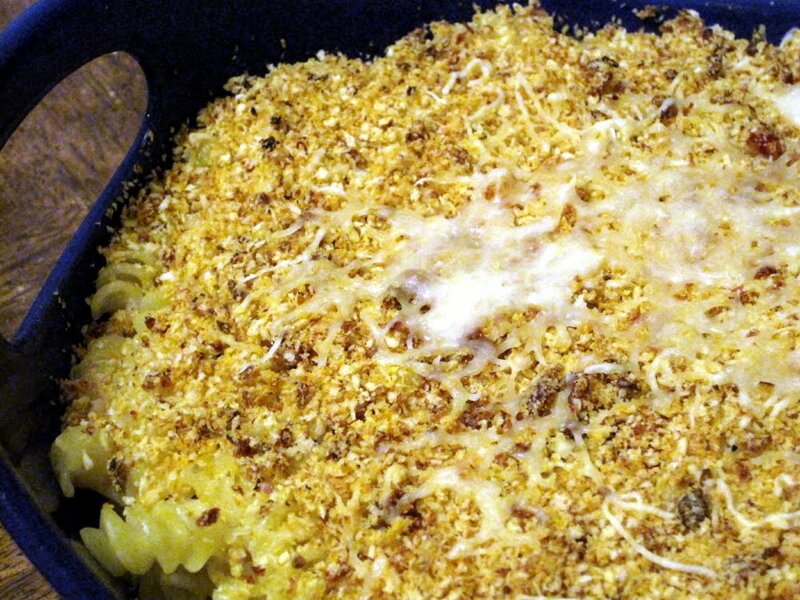 This baked mac-and-cheese is creamy, delicious, and has a terrific surprise topping. First: the mac-and-cheese itself. It's perfectly yummy without being overly gooey or buttery (not that those things can't be good sometimes too!). The flavor is a little more interesting than my usual stove-top recipe because it uses a combination of cheddar and swiss cheeses. I found a great package of a pre-grated Swiss-Gruyere blend on sale at the store, which definitely sped things up, but you can use any combination of cheeses that appeals to you. The topping is what really makes this recipe shine. The method for making flavored breadcrumbs in the food processor is extremely easy and gives excellent results. The crunch from the breadcrumbs and the acid from the sun-dried tomatoes provide the perfect contrast to the mac-and-cheese underneath. 1. Boil the pasta until just shy of al dente. Preheat oven to 400. 2. Meanwhile, put shallot into a food processor and pulse until diced. Without removing the shallot, add garlic and pulse until diced. Add the sun-dried tomatoes, pulse. Finally, add panko to the food processor and pulse until all ingredients are combined. Set the seasoned breadcrumbs aside until the pasta is finished. 3. When pasta is just shy of al dente, strain and then add it back to hot pan. Immediately add the milk and cheeses, and stir to combine. Add salt and pepper to taste. 4. Spray a large casserole dish with oil. Pour in the pasta. 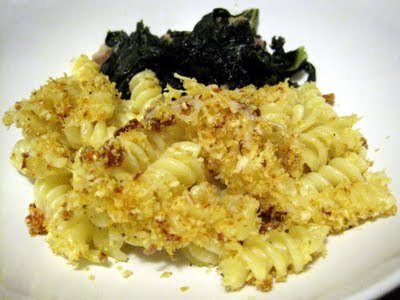 Cover pasta with panko mixture. 5. Bake until top is golden brown (about 8-12 minutes). Despite a lack of posts, I have been slowly but surely plugging along at the BBA Challenge. I lost a big pile of photos when my camera was stolen about a month ago, but I do have a photo that I took with my new camera to share with you! My most recent BBA bread was Kaiser rolls, which were definitely a winner. These Kaiser rolls are one of my favorite recipes in the book so far. 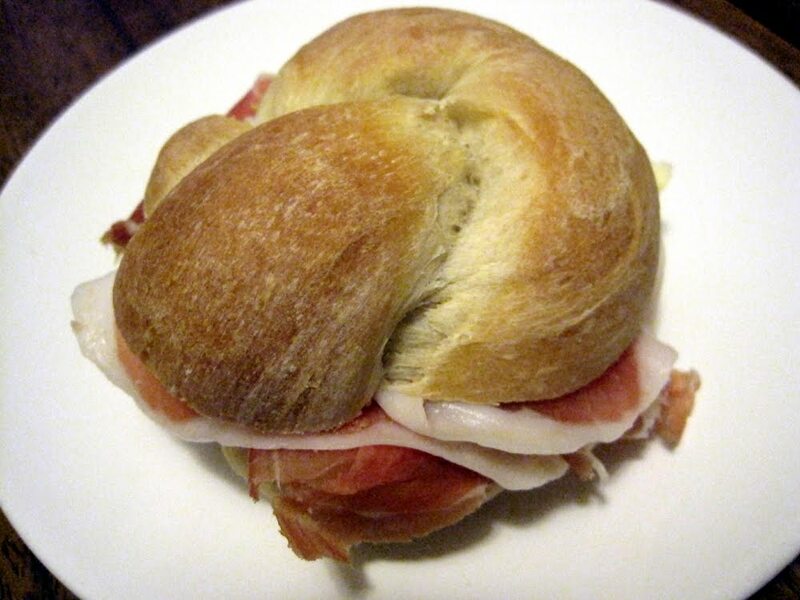 They have that perfect crusty-on-the-outside-soft-on-the-inside texture that sandwich rolls should have. They also made possibly the best sandwich of all time filled with prosciutto, thinly sliced Havarti, and a bit of Dijon mustard. Amazing! 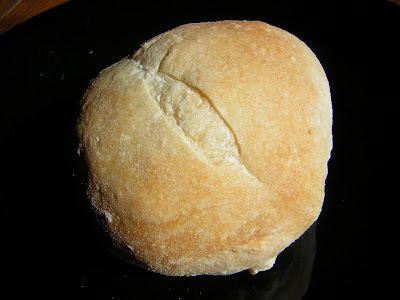 Also, even though these rolls are knotted by hand, the dough is a dream to work with and actually very easy to shape. I was a little worried about this step (particularly because I was trying to squeeze it in right before I had to leave the house for a meeting), but it was a breeze. 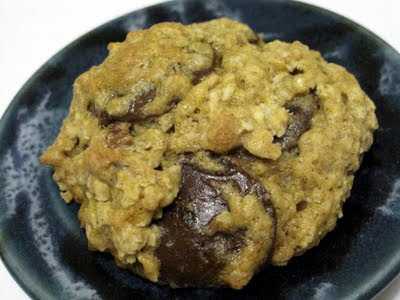 These cookies from Baking Bites are absolutely to-die-for! They have that perfect blend of fall spices, and they're totally addictive. 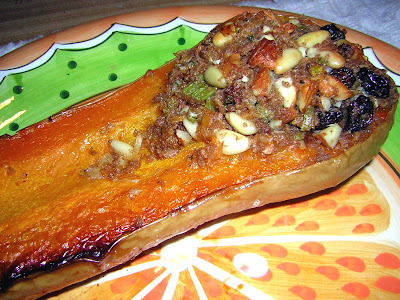 Even though there's only a bit of pureed pumpkin, it adds excellent flavor and keeps them moist. 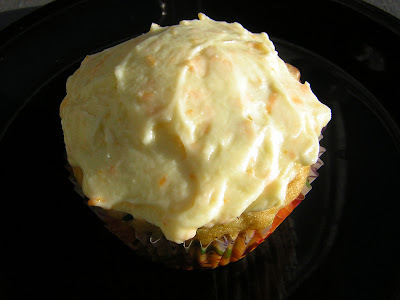 I hit upon this cookie recipe because I had a bit of pureed pumpkin left over from these Halloween cupcakes. This recipe is nice for using up that little extra bit of puree -- the original recipe uses sweet potato, and I think butternut squash would work as well. I do recommend seeking out high-quality couverture wafers for this recipe, although of course regular chocolate chips would be tasty as well. However, the big chunks of dark chocolate really take these over the top! I will definitely be making these again. 1. Whisk together the dry ingredients in a small bowl. 2. Cream together the butter, sugar, and brown sugar. Beat in the egg, followed by the pumpkin puree and vanilla. 3. Stir in the flour, mixing until just blended. Stir in the oats, chocolate, and pecans, again mixing until just combined. 4. (Optional) Pop the dough in the fridge for half an hour to help it firm up. 5. Preheat the oven to 350 degrees. Roll large spoonfuls of dough into balls and space them out on a foil-lined baking sheet. Bake for 12-15 minutes, until the cookies are set. 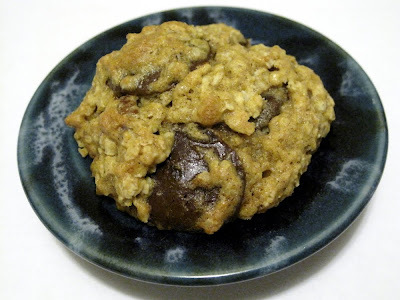 I'm sending this tasty recipe off to Mrs. Kringles Christmas Cookie Bake-off...even though these cookies have a somewhat more "autumn" feel to them, the warm spices and delicious flavor mean they're perfect all through the winter. I don't think Santa would be able to resist! Please click here to check out all the cookies, vote for your favorite, and enter to win some excellent prizes! 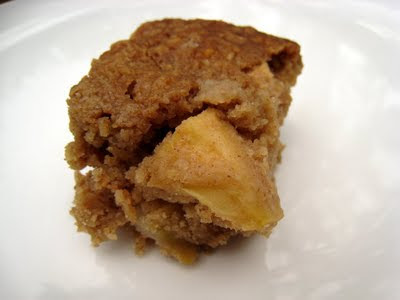 I discovered this recipe in my backlog of unposted recipes, and just had to share it with you! It's from a lovely set of cupcake recipes given to me by my sister a couple of years ago. The original recipe was for carrot cake, but I substituted zucchini since I baked these in the middle of zucchini season when we were absolutely drowning in them! Zucchini and orange make an interesting and tasty combination, and the raisins and chopped nuts add texture and extra delicious-ness. 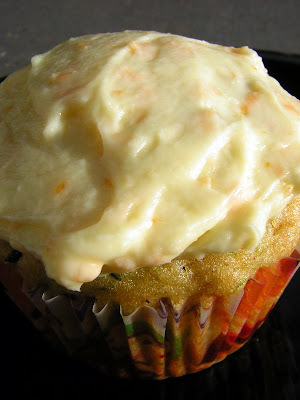 The orange cream cheese frosting is absolutely to-die-for, and would be excellent on many kinds of cupcakes (or even some fancy muffins!). 1. Preheat the oven to 325 degrees. Line twelve muffin tin cups with paper cupcake liners. Spray with nonstick spray. 2. Sift together the flour, baking soda, salt, and cinnamon in a medium bowl. Set aside. In a large bowl, beat together the eggs and sugar on medium speed until smooth and thick, 1 minute. Stop the mixer and scrape the sides as needed. On low speed, mix in the oil, vanilla, and orange zest until blended. Mix in the flour mixture to incorporate. 3. Press down on the zucchini to extract as much liquid as possible. Add to the batter along with the raisins and walnuts and mix. 4. Fill each cupcake liner with 1/4 cup of atter. 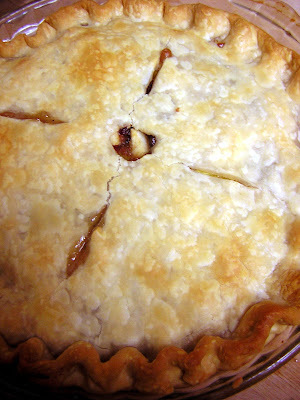 Bake until the top feels firm and a tester comes out clean, 28 minutes. 5. Make the frosting. In the bowl of a stand mixer, combine the butter, cream cheese, and vanilla. Beat until smooth, about 1 minute. Stop the mixer and scrape down the sides as needed. Add the sugar, mixing until smooth, about 1 minute, and then meat on medium speed for 1 minute to lighten the frosting further. Fold in the orange zest with a rubber spatula. 6. Frost the cupcakes once completely cooled. 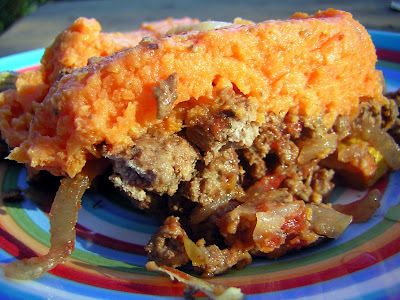 This unusual shepherd's pie is really delicious. I was a little skeptical when I first saw the recipe because I just wasn't sure if everything would "go" together--but the flavors complement each other perfectly. I've made it a couple of times, once with all beef and again with a combination of beef and veal. Both options were fantastic. This dish is nice because it's really a full meal in one pan - meat plus lots of veggies. Although there are two components - the meat-veggie filling and the sweet potato topping - the dish does come together fairly quickly because the potatoes can be boiling while you prepare the filling. Definitely a keeper! 2. Place the sweet potatoes in a pot of fresh salted water and bring to a boil. Cook until under fork tender and mashable. 3. Meanwhile, saute the ground meat in a large hot skillet until lightly browned. Pour off the fat and return the skillet to the stove. Add the onions and garlic; stir and cook for five minutes or until the onions are soft. 4. Add the zucchini; stir and cook for a couple of minutes. Add the artichokes and tomatoes. 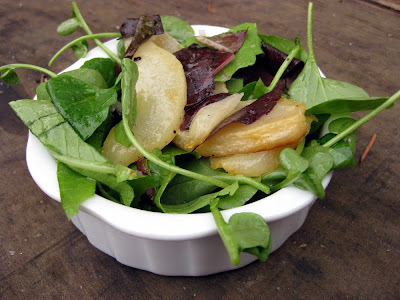 Stir in the balsamic vinegar,honey or sugar, dried herbs and cinnamon. Season to taste with salt and pepper. Cover and bring to a simmer. Cook until the liquid is reduced a bit and everything is nicely tender. Remove from heat. 5. Drain the cooked sweet potatoes and mash them lightly. Season with sea salt, ground pepper and nutmeg. Drizzle with a little fruity olive oil. Add a couple of tablespoons of milk and stir until smooth and fluffy. 6. Layer the beef and veggie mixture in a casserole or baking dish. Top with the mashed sweet potatoes. 7. Bake in the center of a preheated oven until bubbling and hot- about 25 minutes. If the top starts to brown too soon, you can cover it with a piece of aluminum foil. Two weeks until Thanksgiving! I'm looking forward to visiting family in Ohio and taking a little break from work. Plus, of all the holidays Thanksgiving definitely has the best food! 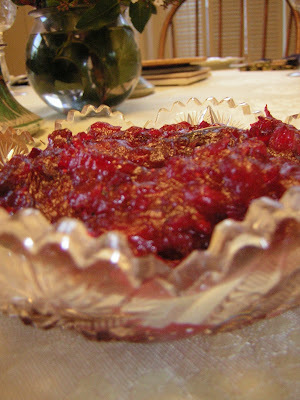 As Thanksgiving approaches, be sure to check out these past recipes from Cupcake Muffin. Any of them would make a fantastic addition to a Thanksgiving table. This soup is easy to pull together and really yummy. 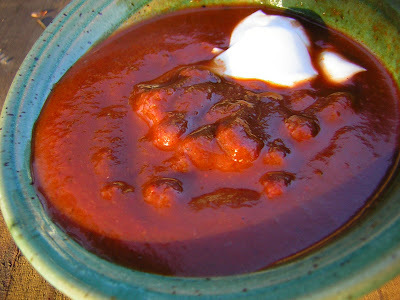 The roasted red pepper adds a unique flavor to the soup, and the beans add substance and protein. In this particular recipe, I didn't think making the beans "from scratch" added too much, so next time I might just open up a can of black beans to make the soup even speedier. It's excellent topped with a little sour cream - some chives would be tasty as well, though I didn't have any on hand this time. Pick through the beans for any stones & place in a pot with a lid. Cover with boiling water about 1 inch above the beans. Let sit until twice in size, at least an hour or two. Meanwhile, heat the olive oil over medium-high heat in a pot. Add the onion and cook until it begins to soften. Add the garlic and cook until the onions and garlic are very tender. Stir in the peppers, oregano, parsley & a good pinch of salt. Cook or about 5 minutes, stirring occasionally. Add the chicken broth. Let cool until the beans are done soaking. Once the pepper mixture has cooled for at least 15 minutes, use a blender to process it until smooth. You will need to do this in batches. Be careful not to fill the blender too full, especially if the mixture is still warm. Pour the pureed pepper mixture into a soup pot. Stir in the soaked beans and bring to a boil. Cover and reduce heat. Simmer the soup for about 1 hour or until beans are tender. Use a fork to smash some of the beans if you wish to thicken it a bit more. 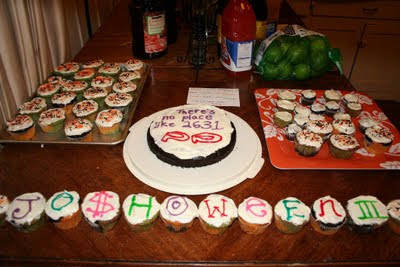 This year I decided to do somewhat crazy cupcakes for Halloween! 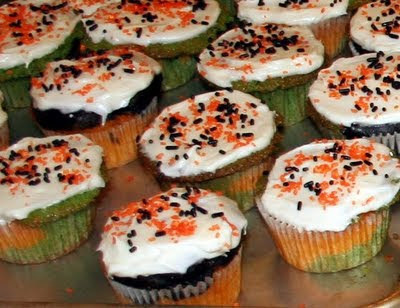 I made three cupcake batters - pistachio, pumpkin, and chocolate - and then combined two flavors in each cupcake. So, there were three options for folks: pistachio-chocolate, pumpkin-pistachio, and chocolate-pumpkin. Each flavor was really yummy on its own, and the combinations were very tasty as well. This was a fun idea and looked really cute. The pistachio batter was delicate and nutty, although it exploded more than a little bit when baked! Luckily, cream cheese frosting covers all flaws. The pumpkin batter was perfectly pumpkin-y, with a perfect light touch of pumpkin pie spice. Finally, the chocolate batter is an old standby of mine from Martha Stewart, which always comes out perfectly. I used gel food coloring to pump up the colors, although of course you could leave these natural as well. The recipe made quite a bit more than anticipated - I thought I was using three recipes for 12 cupcakes, which should have made 36, right? Yet somehow there was a lot more batter than that...not that I'm complaining! The cupcakes were enjoyed by our guests and all got eaten up! Yum. Stir the oil and sugar together. Whisk in the eggs and vanilla. Add the flour, baking powder, pumpkin pie spice and salt. Mix well. Add the pumpkin. Place the pistachios in a blender, pulse until fine. (It does not need to be ultra fine, texture is good.) Add to the pumpkin pie spice, flour, baking powder, and baking soda; mix together. In a large bowl, beat sugar and butter until fluffy. Add eggs, one at a time, making sure each is fully mixed before adding the next. Add the vanilla. Alternatively add the pistachio mixture and the milk, until all of the pistachio mixture and milk has been added. Add the green food coloring. Mix on low just until combined. Line muffin tins with paper liners. Spoon 2 flavors into each muffin cup, and then swirl gently with a toothpick or knife. Bake at 350 degrees for 20 minutes. Cool for 10 minutes before removing from pans. Cool completely, and then frost with cream cheese frosting. 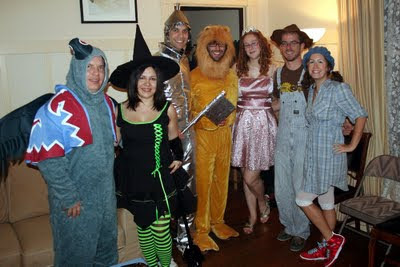 Here's a photo of me with all my housemates in our costumes - we all dressed up as characters from the Wizard of Oz! I'm Glinda in the pink dress. Some of our guests joined in the theme too: we had the Wicked Witch of the East, William Jennings Bryant, and the Man Behind the Curtain! I got enchanted by a pork belly recipe posted on Serious Eats the other day. Unfortunately, I couldn't find pork belly at the grocery store! I was actually pretty surprised - I thought the fancier Berkeley markets would have it. Luckily, the recipe suggested mustard greens and spareribs as possible alternatives, so I bought these instead. I was a little skeptical pulling everything together because I had to combine a few recipes, but the outcome was pretty good! The pork was tender and yummy, but could have been more seasoned; next time I'd add salt and pepper to the meat before searing. 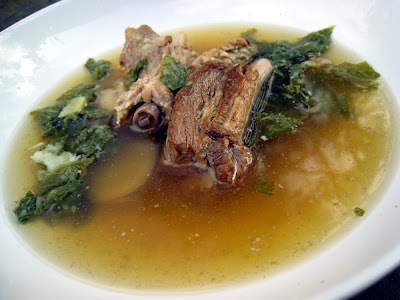 The recipe also produced a lot more broth than the original seemed to, probably because spareribs are bulkier than pork belly since there are so many bones. As such, this makes more of a Chinese-style soup, which we ate over rice. It would also be tasty with noodles, but either way it does seem to need something to serve it with. The mustard greens were an excellent addition - whether you make this with pork belly or spareribs, I definitely wouldn't leave them out. If the spare ribs are still connected in a long strip, use a knife to slice between each bone. The result should be small rib sections that are approximately 1″ by 2″. Heat a large pan or dutch oven with 1/4 cup oil. Add ribs and brown on all sides, about 3-5 minutes. You will need to do this in 2-3 batches. Pour the remaining 1/4 cup oil into a wok or a large pot over medium-low heat. Add the sugar and cook, stirring often, until the sugar dissolves. Then turn the heat to medium, and cook until the sugar turns "a rich caramel brown." Keep a close eye, as the sugar will burn easily. Add the pork and gin. Stir well. Then pour in enough water to just barely cover the pork. Add the ginger, star anise, chiles, and cinnamon. Turn the heat to high and bring to a boil. Reduce heat to a simmer, cover, and cook for 45 minutes to 1 hour, until the meat is cooked through and tender. Meanwhile, chop the mustard greens into thin strips. In a separate pan, heat a bit more oil and add the garlic and ginger. Saute for about 30 seconds, and then add the mustard greens and chicken stock. Turn the heat down to low, cover, and cook for just a few minutes. Remove the cover on the pork, turn the heat to medium and season with drizzle of soy sauce and a sprinkling of salt and sugar to taste. Add the greens and toss everything together for about 1 minute. Taste, and add more salt and/or ground cinnamon as needed. Serve topped with chopped scallions and additional soy sauce.